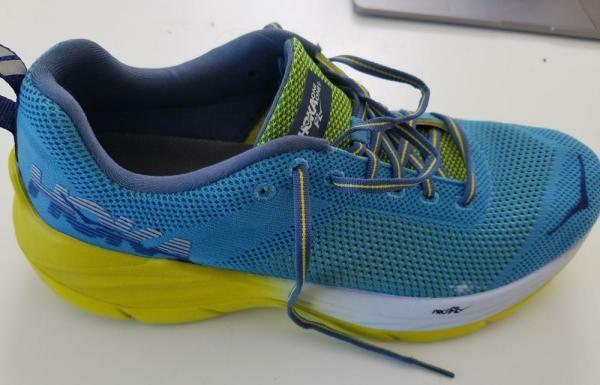 A couple of runners found the Hoka One One to be a lightweight shoe. Some users were surprised that the underfoot platform saved the knees from tension or discomfort. A satisfied wearer commended the effortless energy return of the Mach. Several reviewers were happy that the shoe did not give them blisters. One user was mostly contented that the arch blisters that they used to get in the Clayton were no longer in the Mach. As claimed by some, the fit was snug but yet able to accommodate a comfortable toe-splay. A lot of wearers gave positive remarks to the forefoot cushioning and responsiveness. Many runners reported a comfortable wear right out of the box. A disappointed user disliked the poor shock absorption of the sole unit. Some wearers felt the Mach had a stiffer cushioning than the Clayton, which was its predecessor. A customer wrote that the mushy underfoot resulted in poor proprioception. The tongue was too thin, according to many users. The ride was neither soft nor bouncy and lacked the “race feeling,” a buyer lamented. Several consumers reported that the fit was too narrow; there wasn’t enough room for the foot to relax. Although the Hoka One One Mach received many satisfactory reviews, others could not help but compare it in favor of its predecessor, the Clayton. While most of the Mach’s users admired the design and structural elements, and many others found it pleasant to wear, some found faults in the shoe’s fit and feel. Overall, the Mach was a comfortable shoe, but some improvements are necessary for a completely praiseworthy performance. Before I throw these shoes out or give them to a friend I don’t like, I decided to take some pictures and write this review. I have been icing my feet every few hours for the last 2 days and taking anti-inflammatories round the clock BECAUSE OF THESE SHOES! The cushioning is sorely lacking. I love Hoka. I just ordered several more pairs of Clifton 2 off eBay. I am wearing my Clifton 3 till they fall apart. But I’m not sure if I can forgive Hoka for the Mach. These are attractive shoes. They are lightweight, and look like shoes you would want to wear every day, not just for running. They are low profile and don’t have the typical Hoka HUGE outsole. However, a closer look reveals open pores. This allows for a very lightweight design and breathability BUT allows any moisture on the ground to immediately go right into your shoe and soak your feet. If you jump thru a mud puddle, see those pores? The mud will be soaking your sock. Is it raining? The rain will immediately drench your sock and then your foot. The weather where I live is extremely unpredictable and mud season is long. If I have to plan my runs around when the roads will be dry as bone and there is no chance of slush, mud, or even a slight sprinkle, I’d never make it outside. The tongue is lightly padded. There is a nice reflective loop on the back. The colorway is actually quite beautiful and understated. Nothing screams running shoe or Hoka when you are wearing these shoes. Overall, aside from the open pores, I really like the aesthetics of these shoes. Aside from the minimal padding (addressing in the section below), the fit is excellent. These shoes feature a nice wide toe box with plenty of wiggle room. The size runs similar to other Hokas- about a half a size bigger than typical running shoes. I wear an 11 in Asics and a 10.5 in Hokas. The tongue is padded enough to be comfortable. The laces are flat and stay tied. The shoe is extremely lightweight and makes it seem like you aren’t wearing running shoes. Dear Hoka, you forgot the cushioning! Yeah, this shoe feels like a flat board on the inside. I tried overlooking it. I tried an easy run on the treadmill - pain. I tried a run outside on soft mud/dirt-pain. I tried another run on the treadmill - still pain. I switched to different shoes- no pain. They feel so flat on the inside. Hard and flat. And as I mentioned at the beginning of the review, after one of my treadmills runs in these, the lack of support in the forefoot area caused enough inflammation to my foot to require round the clock ice and Advil. I am not happy. The Hoka Machs have decent traction but not great. The lugs are about ¼ inch deep at the most. Even with minimal use, I can already see signs of wear. I would not feel comfortable using these on wet terrain as the lack of traction would make them slippery. If you notice in the picture, I managed to get a small stone jammed into the groves. The groves are odd shaped (look at the plus-shaped groves towards the toes). I think Hoka missed the mark in the sole on this model. After wearing these for 34 miles, I had to stop because they caused severe pain and inflammation in my forefoot. Just in that time, I can see noticeable wear on the sole. I think the open pore design of the upper is a huge mistake and will cause this shoe to die an early death either from the elements going through the pores or road debris catching on the pores. Maybe on an indoor track, these shoes would last longer. Any shoe that requires me to ice my foot for 2 days and take Advil round the clock, gets a low rating. I’ve never had that happen from any other running shoe. The lack of cushioning is horrific. I can’t recommend this shoe. Overall, I felt like the Mach was a great performance trainer. I'll continue to use it for a variety of training needs but I'll definitely be using it most for tempo workouts or faster long runs. I would encourage you to try them out. You know if you want a shoe that's light enough to race in but still provides good support. I think this should be on your short list of shoes to try. At a tiny 8 oz. the Mach provides a powerful blend of cushion, response, support and we expect durability. It is a great single shoe choice for training and longer racing on road and even smoother trails. The Hoka One One Mach is part of the brand’s three-shoe Fly Collection, a series that delivers a versatile comfort and a streamlined design that lets wearers “fly through” their runs. The Mach is promoted as an ultimate performance trainer; it brings the runner speed through its minimal design and ample cushioning, making it a suitable shoe for fast-paced runs. Many users and even the brand consider the Mach as a descendant of another running shoe – the Clayton 2 – based on the similar geometry and the intended benefits of maximum cushioning and responsiveness inside a lightweight structure. The Mach retains the engineered mesh upper but has done away with the thermoplastic lattice and the midfoot overlays. Instead, the mesh includes open- and closed-knit patterns in strategic areas for breathability and support, respectively. An evolution of the brand’s PRO2Lite midsole, the PROFLY™, makes its way into the Hoka One One Mach. It still has the dual-density structure, but now with improved benefits. The shoe sits on a classic RMAT® outsole for the ultimate combination of elasticity, durability, and grip. The Hoka One One Mach is built following a standard running shoe length, and it is available in a variety of sizes. It has a structure that is similar to many Hoka One One shoes, which supplies maximum room for the forefoot and toes and a snug reinforcement for the midfoot and heel. Runners with low to moderate foot volume will fit best in this shoe. The Mach is available in medium width for both the men’s and women’s versions. The RMAT® is an outsole material made from a blend of injection-molded rubber and ethylene-vinyl acetate (EVA). This combination results in a compound that is elastic and brings higher-level rebound for improved running performance. The rubber-and-foam mixture also gives the outsole a fantastic balance of durability and traction that is perfect for the roads. The tread pattern of the outsole displays a wishbone design, as well as parallel siping on strategic areas. This layout ensures a flexible unit for smoother transitions and an overall enhanced stride. Thanks to the PROFLY™ material, the midsole of the Hoka One One Mach is able to offer a snappy and responsive ride, while also providing calculated cushioning in specific areas: softer in the heel for a protected landing, and firmer in the forefoot for enhanced propulsion. The midsole is constructed following a unique geometry called the Meta-Rocker. This shape means the midsole has a low stack height and a slightly elevated forefoot that forms a fulcrum, like a rocking chair. With this structure, the runner’s natural foot motion and most efficient gait cycle are promoted. Moreover, the Meta-Rocker has an early-stage transition zone, which is behind the metatarsal heads. What this means is that the heel-to-toe transition is smoother and quicker. The Mach’s lightweight, engineered mesh permits a comfortable and contoured fit while permitting maximum-level breathability for a luxurious feel. The vamp and midfoot areas employ an open-knit pattern as airflow is essential in these parts. Conversely, the arch and heel have a close-knit layout to enable support and structure for a problem-free ride. In comparison, the New Balance Fresh Foam Zante v4 utilizes Jacquard mesh in its upper, which intends to provide a sock-like fit by adapting to the shape of the foot. Meanwhile, the interior of the shoe features a no-sew construction, which allows a seamless and irritation-free fit and sensation. Such a form reduces the chances of blistering and chafing.